Hunger pangs?? Are you making a beeline for the fridge or devouring your favourite bag of chips? Then beware and think again! Your junk food is cutting down on health and adding to those unwanted inches around your belly. Start your morning with a sumptuous breakfast of oats, eggs, or yogurt. Opt for an Indian breakfast like idli, dosa, upma, poha, or cheela that are healthy and nutritious. At lunch, ensure you have a healthy combination of carbohydrates, proteins, and fats. The trick to staying fit is to eat healthy food at frequent intervals. While you are busy at work, or dealing with your daily chores, munch on carrot sticks, cucumbers, celery, or fruits. Keeping a snack dairy will always keep you cautious about your intake. Chances are that when you take a look at your own food intake list, it may alarm you, causing you to cut down on your junk intake. 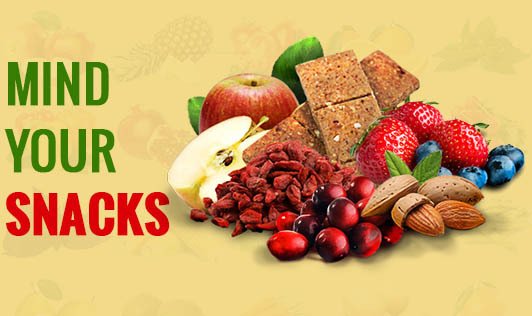 Opt for one of these snacks to curb your hunger pangs. • Dry fruits and nuts like walnuts, almonds, pistachios, figs, dates, apricots etc. Rule of Thumb While Snacking- Be creative with your snack options, choose whole foods over processed ones.